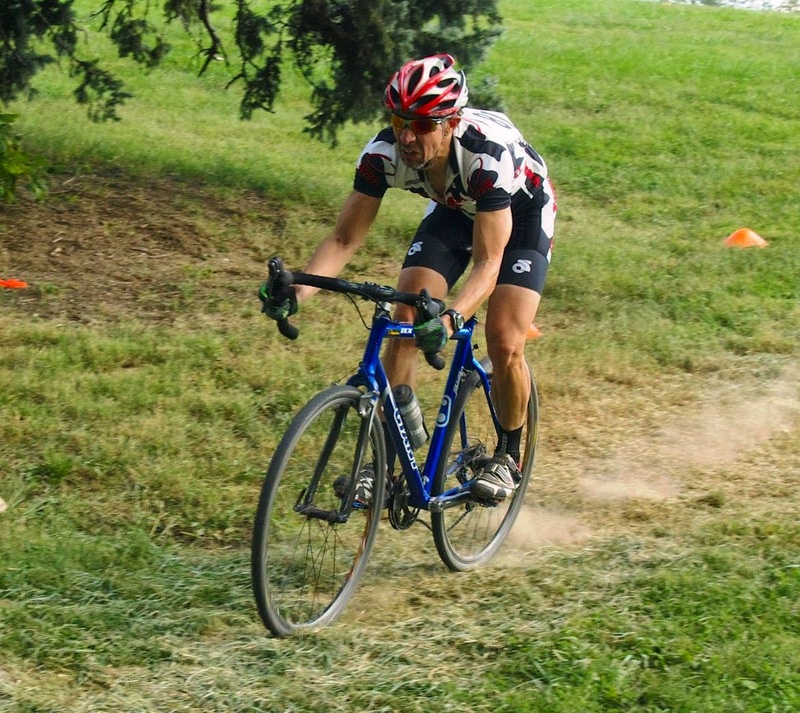 The 2014 cyclocross season is well underway with two events held over the weekend in Missouri. 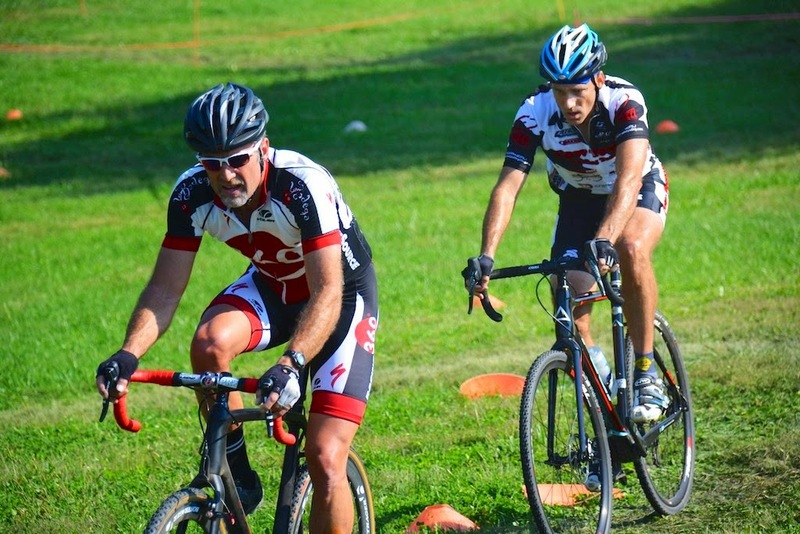 Both the CoMo Cyclocross Cup in Columbia and the Cliff Drive Cyclocross Classic in Kansas City had heated racing both in the form of hot weather and heated battles on the courses. Doug Stone's form is coming along great and it showed over the weekend with two 2nd place finishes in the Master's 40+ class. Both days Doug battled with Rick Moseley of 360 Racing. Look for great racing between these two in the weeks to come. 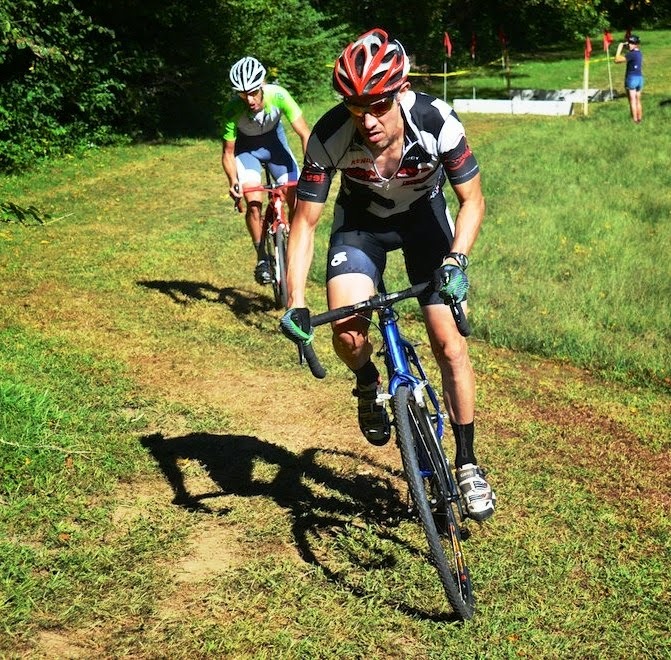 Chris Locke ventured over to Columbia to represent the team and test the offerings that the CoMo Cyclocross Cup had to offer. Great course and event with night racing on Saturday evening. Beer and food flowed during the evening of which Locke consumed too much resulting in a 5th place finish on the day. Damian Almanza bombed the downhill sections at Cliff Drive in the Men's Cat 3/4 class. Some bad luck during the race caused a DNF. 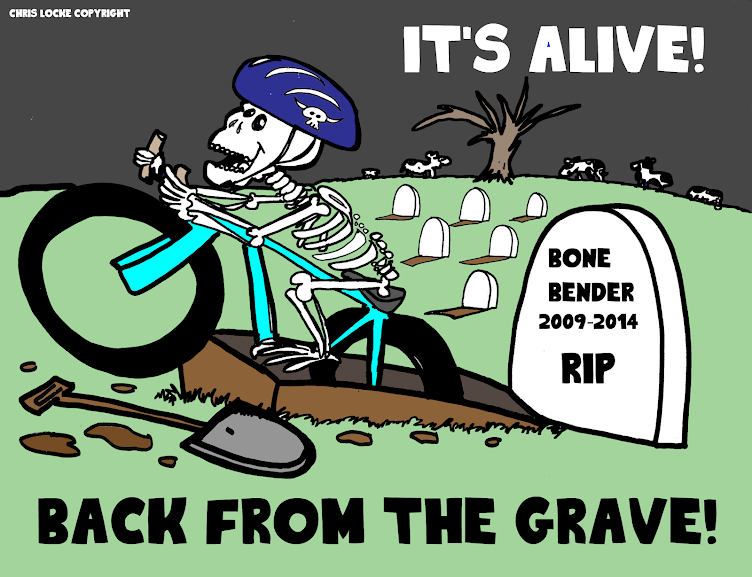 The 2014 Cyclo-cross season is underway. The first local event was the Buffalo Bill Cyclocross Race brought to us by the Santa Fe Trails Bicycle and Coffee Shop. This years event was held at Havens Memorial Park in Leavenworth, Kansas. Havens is a small park located on the edge of town and was last used back in 2007. The course has not changed much over the years. It was hilly then and it is still hilly today. This did not stop local cyclo-cross racers from coming out to test themselves on the freshly mowed course. The energy sapping course quickly broke up the tight packs and by the midway point it was only the strongest riders who were able to maintain the pace. 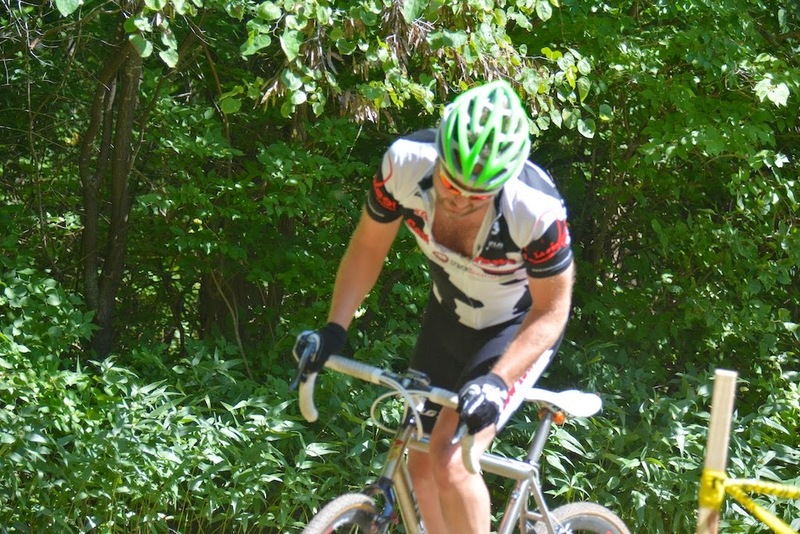 Doug Stone started off his season on a new disc brake CX ride and put those brakes to good use attacking the course to earn 3rd place in the highly competitive Masters 40+ class. Doug put in a last lap charge and passed KD200 winner Dan Hughes for the final step on the podium. 360 Racing's John Jones took the class win ahead of Paul Aldeguer. Former junior standout Christopher Locke returned to racing in the Men's Cat 4 division. "The Cat 4's are really fast, I actually thought my dad had signed me up for the Men's open division when I saw the leader take off and eventually lap me". Looks like little junior has a lot of work to do as he finished in 16th place on the day. David Wathen, who was fresh off a 100 miler the day before, used today's event as a training event. 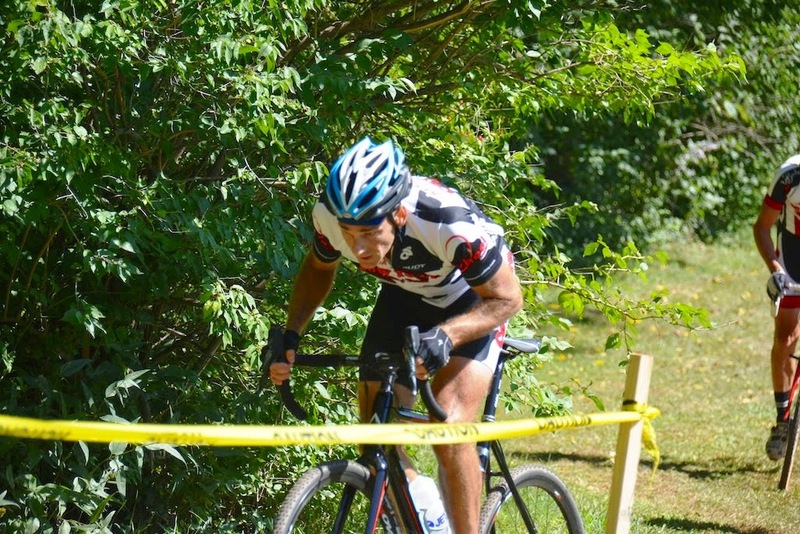 "I have been focusing on my base, needed to get some time in on the cross bike on a cross course and will now start to add some intensity to my training" said Wathen. "Last year I peaked early and do not want to make the same mistake this year. I am hoping to have my racing legs come November and December when it counts". A nice sized field lined up for the Men's Cat 1/2/3 race. Damian Almanza put in a strong race to finish up in 15th place. "I wanted to test myself in the open class and to put some hurt in this old body of mine. It was a power course and I was a little down on power, but it is just the first race of the year." They say when you get old you start to make poor decisions. "I decided to race Single Speed today which was not the best idea for a 49 year old". Despite not having the power to climb with the "Fast" riders Chris Locke took home 5th place on the day.